Feb. 27 (Bloomberg) -- Kynikos Associates Ltd. President and Founder Jim Chanos and Yale University Senior Fellow Stephen Roach debate the future of the Chinese economy. They speak on Bloomberg Television's "Street Smart." I was reminded of the quote below after reading THIS article on ValueWalk. Feb. 26 (Bloomberg) -- Sen. Elizabeth Warren (D-MA) questions Fed Chairman Ben Bernanke about the "too big to fail" problem during the chairman's testimony before the Senate Banking Committee. For this week’s issue of Time magazine, the cover story is Bitter Pill: Why Medical Bills Are Killing Us, by Steven Brill. I had to have something to read while the plane was taking off, and that turned out to be it. (Since I got my iPad I no longer carry books, so I make sure I have something to peruse while waiting to be able to use my electronics in the air.) I have read work by Steve Brill in the past and like his style, so even though I don’t usually read Time, I picked up this issue on health care. I wish I could get every voter in America to read that article and then go to the Internet, Google the piece, and read the comments. I don’t agree with all he wrote, but he does a marvelous job of giving us the picture on just how broken the American healthcare system is in terms of costs. He goes into detail about how hospitals create those staggering bills. If you have private insurance or a government plan, you don’t have to pay those prices, but what if you don’t? The billing system is out of control: $1.50 for a 1.5-cent acetaminophen pill (Tylenol). A simple niacin tablet marked up 240 times. Routine products like gauze marked up 10 times. Billing for a lamp shade? Are you serious? Double and triple billing for routine items that no insurance company or government agency will pay for, but that you will be billed for if you are on your own. You have read the stories or heard them from friends, but Brill makes it real. ALUMINIUM was once more costly than gold. Napoleon III, emperor of France, reserved cutlery made from it for his most favoured guests, and the Washington monument, in America’s capital, was capped with it not because the builders were cheapskates but because they wanted to show off. How times change. And in aluminium’s case they changed because, in the late 1880s, Charles Hall and Paul Héroult worked out how to separate the stuff from its oxide using electricity rather than chemical reducing agents. Now, the founders of Metalysis, a small British firm, hope to do much the same with tantalum, titanium and a host of other recherché and expensive metallic elements including neodymium, tungsten and vanadium. The effect could be profound. Marc Andreessen made his first fortune writing the code that became Netscape Navigator, the Internet browser. He is now a venture capitalist who evangelizes about the growing importance of software in business today. Indeed, he proclaims that software is taking over the world – that it will be the primary source of added value – and offers the following prediction: the global economy will one day be divided between people who tell computers what to do and people who are told by computers what to do. Andreessen’s aim is to shock his listeners – not just for effect, but to get them to do something about it. To stop the world from being divided between a few alpha programmers and many drones, he wants the potential drones to stop taking easy liberal arts courses in college. Instead, he wants them to focus on courses in science, technology, engineering, and math (STEM), where the good jobs will be. But will this solve the problem that he poses? Perhaps not. Two attributes of software creation allow a few talented programmers to corner the market and take all the associated profits. First, software with a slight edge tends to get a significantly greater share of the available market; and, second, the available market is global, because it costs so little to make an extra copy and send it anywhere in the world. As a result, those who are creative and competent enough to write that slightly better search engine will capture the global market. In 2012, prominent hedge fund managers made headlines by successfully trading against JPMorgan Chase & Co., spending lots of money to influence the U.S. presidential election, and proclaiming that a nutritional supplements company was operating a pyramid scheme. While they made plenty of noise, very few of these traders managed to beat the U.S. stock market after charging their investors rich fees. But in northern New Jersey, David Tepper had another extremely strong year. The founder and head of Appaloosa Management guided his flagship hedge fund to net returns of nearly 30%. Tepper personally made an estimated $2.2 billion in 2012, topping Forbes’ list of the 40 highest-earning hedge fund managers and traders. But how do we know when irrational exuberance has unduly escalated asset values? PIMCO’s dear friend and former counselor Alan Greenspan coined this now famous phrase in the midst of what turned out to be a fairly rationally priced stock market in late 1996. While the market was indeed moving in the direction of “dot-com” fever three to four years later, the Dow Jones Industrial Average at the time was a relatively anorexic 6,000, and the trailing P/E ratio was only 12x. For a central bank that was then more concerned about economic growth and inflation as opposed to stock prices, risk spreads, and artificially suppressed interest rates, the Chairman’s query made global headlines, became a book title for Professor Robert Shiller and a strategic beacon for portfolio managers thereafter. Having experienced two and perhaps three bouts of significant market irrationality since Greenspan’s speech (the 1998 Asian Crisis, 2000 Dot-Coms, and of course 2007’s subprime euphoria), investors these days have their ears pressed to the ground and eyes glued to the tape for any sign of renewed irrationality. If the game is now musical chairs as opposed to Chuck Prince’s marathon dancing, it pays to be close to a chair, even as the “can’t miss” euphoria mesmerizes 2013 asset managers worldwide. Jim has just returned from San Francisco, where he was attending the JP Morgan Healthcare conference with two colleagues. This conference is in its fourth decade and is the must-have ticket for players in the bio pharma industry. Companies vie for the opportunity to present to about 10,000 delegates, and those that are not admitted throng hotels in the area, with a further 10,000 people doing deals and presenting on the fringe. This was Jim's third outing to the event, and the tone was very upbeat. The FDA (America's drug regulator) appears to be more proactive in approving compounds, and over 30 novel drugs (as opposed to reworking of established molecules) were launched last year. Among these was Xtandi, the Medivation prostate drug we have written of before, and Kryopolis (for multiple myeloma) from Onyx, another company we have supported. Both are doing very well, but the stock prices of their manufacturers have probably caught up with events. The table below sets out the shares we prefer as buys after the conference – (with the usual caveat emptor label). I had previously posted the audio of this, but now the video is up. And if you haven't seen their 2009 discussion (available HERE), you may want to check that out too. For interested readers (which is likely all of you), The Essays of Warren Buffett: Lessons for Corporate America, Third Edition will be released next week. Irvine’s new book, A Slap in the Face: Why Insults Hurt--And Why They Shouldn't, was just released. It is a follow-up to his book A Guide to the Good Life. Jim Fleming: Although it can be uncomfortable, to look death in the face, contemplatives and philosophers have been doing that for a millennium. Zen Buddhists and Hindu Mystics, the Hedonists of Ancient Greece, the Cynics of Rome, when philosopher William Irvine went looking philosophy of life, he wandered those obvious paths. Then he stumbled upon the Stoics. Irvine says Stoicism teaches that minding our mortality can help us live a more joyful life. Irvine: Stoics thought a lot about death. When you tell people that, they think it’s a horribly morbid thing to do. The thing about death is, if you fully realize that your days on earth are limited, it can have the effect of making you want to maximize your use of those days. You want to reach a stage where we wake up in the morning; it is a cause for excitement and joy. Jim Fleming: Yeah, that is really a wonderful thing; it is exactly the opposite of the way an awful lot of people do it. You wake up in the morning and you think, “OK, I have one day less.” The end is coming closer, your saying forget about it. Not exactly forget about it. Acknowledge it and take joy in the fact that you are still here. Irvine: Yeah, you don’t dwell on death. You contemplate it. The contemplation consists of flickering thoughts that go through your mind. Suppose I’m doing something utterly ordinary. Suppose I’m taking a walk with my wife, simple enough a thing, but while I’m doing it, I find myself, trying to imagine what this event will seem like retrospectively. I can easily imagine a situation where I have outlived my wife, or that I’m old and bed ridden in a nursing home and can’t walk. Under those circumstances, I would find myself wanting to go back in time, to that very walk, then the thought to return to the present, but here I am, actually experiencing the thing that I someday might really wish I could experience. Feb. 25 (Bloomberg) -- James Grant, founder & editor of Grant's Interest Rate Observer, predicts that the result of recent Federal Reserve action will prompt a return to the gold standard for the United States. He speaks on Bloomberg Television's "Bloomberg Surveillance." The U.S. economy appears suspended at the boundary between tepid growth and recession, requiring a trillion-dollar federal deficit and unprecedented monetary easing simply to maintain that position. The Federal Reserve continues a well-known and fully-announced policy of quantitative easing, on course to push the monetary base (currency and bank reserves) to 27 cents per dollar of nominal GDP. The last time the monetary base reached even 17 cents per dollar of nominal GDP was in the early 1940’s. This was not unwound by subsequent monetary tightening, but instead by a near-doubling in the consumer price index by 1952. Based on the strong relationship between the monetary base and short-term interest rates, even a normalization of short-term interest rates to 2% would tolerate no more than about 9 cents of base money per dollar of nominal GDP without inflation. As a result, an eventual normalization of Fed policy would require either a 50% contraction in the monetary base, a doubling of the consumer price index, or about 14 years of economic growth at a 5% nominal rate. It is doubtful that the Federal Reserve will be able to extricate itself smoothly from its current policy stance by any of these means. Are those who can't remember the crash condemned to repeat it? Markets have been rising and investors returning to stocks, thanks to cheap money from central banks, a rash of takeover deals, the glimmers of economic recovery—and an epidemic of amnesia. That could lead some to take more risk than they should and incur losses they can't withstand. So it is vital to evaluate whether you suffer from investing amnesia and, if you are, to counteract it before it is too late. Joshua Pearce takes unusual satisfaction in strolling through Walmart. The shelves laden with toys, household items, tools and clothing inspire in him a certain smugness, a pride in American entrepreneurship. But it’s not because Pearce admires the chain as an empire built by a self-made man. Pearce swells with pride at Walmart because the store is full of mass-manufactured objects that he could make himself. “I take great pleasure — and my wife teases me about it — walking though Walmart and saying, ‘I could print that, I could print that, I could print that,’ ” Pearce says. Pearce is at the forefront of what may be the next manufacturing revolution. Using a technique known as 3-D printing, regular people can now make goods typically produced in huge quantities in factories overseas. Need a mug? A tape dispenser? A chess piece? A pair of shoes? It’s as simple as pressing the print key. 3-D printing builds objects by piling up successive layers of material, hence its more technical moniker, “additive manufacturing.” You start by designing your product on a computer screen with drafting software. That design then goes through a program that slices it up, translating it into a stack of two-dimensional layers. The printer constructs the object by depositing the first layer of material — such as molten plastic that hardens — and then another and another, gradually creating the desired shape. As the printer head moves back and forth, your 3-D vision becomes reality. Arnott comes in around the 2:40 mark. His claim to fame is investing but he also has a namesake whose initial claim to fame was marijuana smuggling. While his namesake has an updated website, he doesn’t write regular memos, the way Mark does to his investors. Though there is no fixed frequency, the update is eagerly looked forward to and widely discussed. Not only is Marks a big name in equity investing, he is even bigger in distress debt. He divides his time between Los Angeles, where his firm, Oaktree Capital, is headquartered, and New York, where he reportedly plunked $52.5 million for a 30-room duplex last year. He also funded the ascent of bond market maverick Jeffrey Gundlach, both being ex-TCW fund managers. After his bitter parting from TCW, Gundlach’s DoubleLine Capital was jump-started by capital provided by Marks. At 66, he is sprightly but far from impressed with the current bounce in the S&P 500. According to him, the biggest risk now is edgy uninformed investors who are less worried about losing money and more worried about losing opportunities. At the Mines and Money London conference in December 2012, Sandstorm Gold President and CEO, Nolan Watson, gave a keynote speech on resource finance. You must always check six o’clock…..
A big thanks to David for passing this along. It is applicable to investing in many ways. This is from The Intelligent Investor (Revised Edition). The quote below is from Sam Walton: Made In America. “I guess everybody who knew I was going ahead with the discounting idea on my own really did think I’d completely lost my mind. I laugh now when I look back on Wal-Mart’s beginning. In 1962, the discount industry was fairly young and full of high-living, big-spending promoters driving around in Cadillacs—guys like Herb Gibson—who had the world by the tail. But it had very few of what you’d call good operators—until 1962, the year which turned out to be the big one for discounting. In that year, four companies that I know of started discount chains. S. S. Kresge, a big, 800-store variety chain, opened a discount store in Garden City, Michigan, and called it Kmart. F. W. Woolworth, the granddaddy of them all, started its Woolco chain. Dayton-Hudson out of Minneapolis opened its first Target store. And some independent down in Rogers, Arkansas, opened something called a Wal-Mart. At the time, and for quite a while after that, I can guarantee you that hardly anybody noticed that last guy. Heck, within five years, Kmart had 250 stores to our 19, and sales of more than $800 million to our $9 million. Here’s what makes me laugh today: it would have been absolutely impossible to convince anybody back then that in thirty years most all of the early discounters would be gone, that three of these four new chains would be the biggest, best-run operators in the business, that the one to fold up would be Woolco, and that the biggest, most profitable one would be the one down in Arkansas. Sometimes even I have trouble believing it. Feb. 19 (Bloomberg) -- Nassim Nicholas Taleb, a New York University professor and author of "The Black Swan" and "Antifragile: Things That Gain From Disorder," talks about financial markets, the banking industry and fiscal policy. He speaks with Erik Schatzker and Sara Eisen on Bloomberg Television's "Market Makers." Feb. 19 (Bloomberg) -- Howard Marks, chairman of Oaktree Capital Group LLC, talks about credit markets and his investment strategy. He speaks with Erik Schatzker and Sara Eisen on Bloomberg Television's "Market Makers. Thanks to Will for bringing this back up to me. This quote is from my friend Miguel Barbosa’s interview with Alice Schroeder (HERE). That comment from Schroeder is in line with a comment Mr. Buffett made at the Berkshire Hathaway Annual Meeting last year, when he said: "Charlie and I have a number of filters that things have to get through before we'll think about them." I’ve mentioned filters on a couple of occasions (HEREand HERE), and I’ll reiterate that I think it is one of the most important things to spend time developing well in order to achieve “mastery” in the investment business (note that mastery still means you’ll make plenty of mistakes, especially in the field of investing). If your filters are good enough, it will also make it difficult to attend conferences where you network with a lot of other investors. Many people will try to talk to you (sometimes endlessly) about their favorite stock idea; it won’t pass one or more of your filters, so you will lose interest; and yet they will likely keep talking. Thanks to Derrick for reminding me about this. Peter Day talks with the prominent investment manager Jeremy Grantham about managing progress in a world of finite resources. "Most people aren't cut out for value investing, because human nature shrinks from pain," the money manager Jean-Marie Eveillard told me this past week. His words are a reminder that making money on cheap stocks—the goal of every value investor—is harder than it sounds and can take years to play out. Lately, value investing has seemed easy. Over the past year, the Russell 1000 Value Index, a yardstick of cheap stocks with sluggish expected earnings, is up 19%, compared with 11% for pricier "growth" stocks and 15% for the full Russell 1000 index of big U.S. stocks. The public has started to notice: Mutual funds specializing in large value stocks took in $2.4 billion in January. But as Mr. Eveillard warns, the long-term rewards don't go to people who think value investing is easy. Superior returns can be earned only by those who know that it is hard—and stay put. Mohnish Pabrai is used to making investment pilgrimages. The ace investor is a regular at Warren Buffett’s annual Berkshire Hathaway meeting as well as at the Value Investing Congress that is held every year in New York. This year, too, Pabrai has made the trip from his Irvine, California, office on the West Coast to check if he is missing out on anything. That is enough opportunity for us to catch up with him at the Marriott Marquis Hotel, on New York’s Times Square. The Marquis raked up much controversy when it was being built, but is now famous for housing New York’s only rooftop revolving restaurant. Pabrai’s investing style, however, has been anything but controversial. His cloning strategy, which almost anyone can implement but not many do, has made Pabrai a multi-millionaire many times over. All those millions are now being put to very good use through his Dakshana Foundation. It seems then he has decided to not only clone Buffett’s investing style but also his intent to give away most of his riches, to causes that matter. Make no mistake, though, while the thought is benevolent, return on investment is still the driving factor. It is by now almost trite to say that there are deals and then there are Buffett deals. And the $23 billion acquisition of H.J. Heinz is certainly a Buffett deal. Warren E. Buffett is known for picking public targets, setting his price and the targets agreeing without much bargaining to be acquired. If you need examples, look at Berkshire Hathaway’s big acquisitions of Burlington Northern, Lubrizoil and Wrigley’s. In those deals, once Mr. Buffett showed up, the companies appeared to lose interest in finding any other bidders. We don’t know the full story of what Heinz, a legendary consumer products company, did to find other suitors or to make sure shareholders were getting a full price. We will learn more once the proxy statement for the deal is filed. But this is an unusual deal already even at the beginning. For evidence, you need look no further than the agreement for the deal filed on Friday morning. Given the extent and maturity of the recent advance, it’s very odd that analysts are now beginning to toss around the idea that stocks have entered a secular bull market. 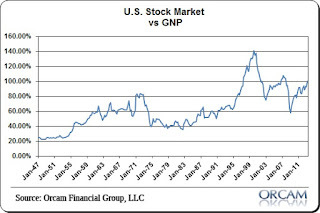 These notions are based not on the level of valuation, nor on the duration of the secular bear since 2000, but instead on the idea that stocks have gone nowhere for a long time and the recent advance might be enough to break the downtrend we’ve seen in the inflation-adjusted S&P 500 since 2000. 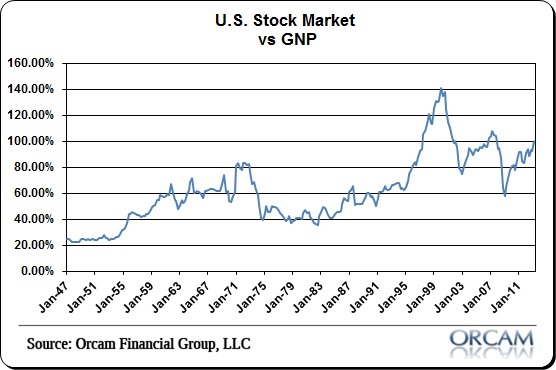 Unfortunately, secular bull markets do not begin simply because stocks have gone nowhere for a long while. They begin at the point that valuations become so depressed - again, about 7 on the Shiller P/E - that strong and sustained long-term returns are baked in the cake. Similarly, secular bears tend to begin at the point where valuations are so extreme - about 24 or higher on a Shiller P/E - that weak and ephemeral long-term returns are baked in the cake. The intervening secular moves simply take the market from one extreme to another over the course of something on the order of 15-20 years. "We make no heroic assumptions in our analysis, hoping, instead, that by compounding multiple conservative assumptions, we will create such a substantial margin of safety that a lot can go wrong without impairing our capital much or even at all. We never invest just to invest and don’t bet blindly on mean reversion or on historical relationships holding up. Our settings are permanently turned to “risk off.”"
“Ignorance is degrading only when it is found in company with riches. Want and penury restrain the poor man; his employment takes the place of knowledge and occupies his thoughts: while rich men who are ignorant live for their pleasure only, and resemble a beast; as may be seen daily. They are to be reproached also for not having used wealth and leisure for that which lends them their greatest value. “One can never read too little of bad, or too much of good books: bad books are intellectual poison; they destroy the mind. For those interested, click on the picture below (or click HERE). Daniel Kahneman is Professor of Psychology and Public Affairs Emeritus at Princeton University’s Woodrow Wilson School and the 2002 winner of the Nobel Prize in Economic Sciences. I recently sat down with Kahneman to talk about how his prize winning theories apply to investing. Video and a transcript of our conversation follows. I’m not 100% sure if that is an exact quote. I had it saved in an old email from May 3, 2010, so I’m assuming it is from Berkshire’s 2010 Annual Meeting. Next to the quote I wrote that Munger mentioned that once he found BYD, he just ignored the rest of China. Some of the biggest U.S. hedge-fund investors have made billions betting against the yen, exploiting Japan's determination to weaken its currency and boost its economy. Wagering against the yen has emerged as the hottest trade on Wall Street over the past three months. George Soros, who made a fortune shorting the British pound in the 1990s, has scored gains of almost $1 billion on the trade since November, according to people with knowledge of the firm's positions. Others reaping big trading profits by riding the yen down include David Einhorn's Greenlight Capital, Daniel Loeb's Third Point LLC and Kyle Bass's Hayman Capital Management LP, investors say. In light of Berkshire’s acquisition, I thought this 2004 Gladwell article might be interesting to revisit. Personally, I use Trader Joe’s organic ketchup instead of Heinz. Carol Loomis also write about the deal HERE. Tom Russo was also on Bloomberg discussing the deal HERE. Warren Buffett's Berkshire Hathaway Inc and 3G Capital will buy H.J. Heinz Co for $72.50 a share, or $23.2 billion in cash, Heinz said on Thursday. Including debt assumption, Heinz valued the deal at $28 billion, which it called the largest in food industry history. Heinz said the deal would be financed with cash from Berkshire and 3G, debt rollover and debt financing from J.P. Morgan and Wells Fargo. The company did not elaborate on what portion of the cash would be contributed by Berkshire and what portion would come from 3G. CNBC reported that each side would put up $4.5 billion cash as part of the purchase. "It's my kind of deal and it's my kind of partner," Buffett told CNBC, adding that Berkshire and 3G would be equal equity partners. Thanks to Barry for passing this along. I think there is a lot of wisdom in the talk that can apply to investors, especially the parts about putting the right procedures in place to avoid mistakes. I was once again reminded of habits and checklists. I’d like to begin by thanking the Knight Foundation for the invitation to speak. I’ve been asked to give a talk about decision-making. I’m going to focus today on bad decisions, on the causes and repercussions of failure. The failure I’ll be talking about is my own. For those who do not know who I am, let me give you a brief summary. I am the author of a book on creativity that contained several fabricated Bob Dylan quotes. I committed plagiarism on my blog, taking, without credit or citation, an entire paragraph from the blog of Christian Jarrett. I also plagiarized from myself. I lied to a journalist named Michael Moynihan to cover up the Dylan fabrications. Sixteen years ago a book by Clayton Christensen changed business thinking forever. The Innovator’s Dilemma looked at industries ranging from disk drives to steel to mechanical excavators and exposed a surprising phenomenon: When big companies fail, it’s often not because they do something wrong but because they do everything right. Successful businesses, Christensen explained, are trained to focus on what he calls sustaining innovations—innovations at the profitable, high end of the market, making things incrementally bigger, more powerful, and more efficient. The problem is that this leaves companies vulnerable to the disruptive innovations that emerge in the murky, low-margin bottom of the market. And this is where the true revolutions occur, creating new markets and wreaking havoc within industries. Think: the PC, the MP3, the transistor radio. In the meantime, Christensen has faced some major disruptions of his own. In July 2010 he suffered a debilitating stroke that left him unable to speak. But within weeks he was using Rosetta Stone to reteach himself the English language, and within months he had begun writing again. His recent book How Will You Measure Your Life? came out last year, and a new work, The Capitalist’s Dilemma, is due out in 2014. Hussman Weekly Market Comment: Shall We Dance? Last week, Investors Intelligence reported that the percentage of bullish investment advisors increased to 54.3%, with bears contracting to 22.3%. Vickers reported that corporate insiders are again selling at a nearly frantic pace of 9.2 shares sold for every share purchased, and the NAAIM survey reported that the average overall equity exposure reported by active investment managers reached 104.25% at the end of January – a leveraged position, and the highest figure in the history of the survey. Indeed, among individual survey participants, the lowest allocation was 60% - the most bullish exposure ever for the most bearish participant in the survey. The previous record in the survey’s history was 96% in early 2007. Rachel Fox, whom I did a fun little interview with HERE, was on CNBC today (video below). And while we are on the theme of mission creep, the incoming Bank of England Governor Mark Carney has given the clear impression from his statements over recent weeks that he does not agree with Mervyn King’s comments that QE is reaching the limits of effectiveness. Carney is willing to be much more aggressive – at least George Osborne will be pleased. In his evidence on Thursday to the Treasury select committee he repeated his idea that if existing QE measures fell short, central banks should consider shifting to targeting nominal gross domestic product, which would allow them to respond much more aggressively to a downturn in economic output and place as much weight on supporting growth as reining in inflation. Now personally I have no great ideological attachment to inflation targeting as opposed to any other method to control inflation, but I note with alarm the tendency of policymakers to become more and more interventionist in their monetary experiments. It may be that central bankers will keep control of the tiger they are riding, but history suggests that central bank intervention may make things worse in the long run rather than better. Marc Faber’s comment that he is so bearish that he sometimes wants to throw himself out of the window really resonates with me when I see what the central bankers are doing. In 2005 I described Alan Greenspan as an economic war criminal when most others had decided he was “the greatest central banker who ever lived”, Hence I note with alarm that some commentators are so excited about the appointment of Mark Carney to the Bank of England Governorship that now he Carney, is now being dubbed “the world’s greatest central banker”. Oh dear! From everything I have read so far I fear that in the fullness of time he will have more similarities with Alan Greenspan than just this unwanted accolade and his legacy will be equally destructive.